firefly.rr has no other items for sale. Sales tax may apply when shipping to: AL(4.0%), AZ(5.6%), AR(6.5%), CA(7.25%), CO(2.9%), CT(6.35%), DC(5.75%), FL(6.0%), GA(4.0%), GU(4.0%), HI(4.166%), ID(6.0%), IL(6.25%), IN(7.0%), IA*, KS(6.5%), KY(6.0%), LA(5.0%), ME(5.5%), MD(6.0%), MA(6.25%), MI(6.0%), MN*, MS(7.0%), MO(4.225%), NE(5.5%), NV(6.85%), NJ(6.625%), NM(5.125%), NY(4.0%), NC(4.75%), ND(5.0%), OH(5.75%), OK(4.5%), PA(6.0%), PR(10.5%), RI(7.0%), SC(6.0%), SD(4.0%), TN(7.0%), TX(6.25%), UT(5.95%), VT(6.0%), VA(5.3%), WA*, WV(6.0%), WI(5.0%), WY(4.0%). Loved my product and fast shipping! 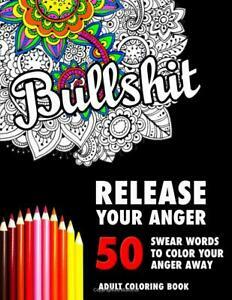 I think it is a very amusing coloring book. My step mother, who I bought this for, has always colored for stress relief, and she curses a lot so I figured why not try this! I think she’ll love it. Although, I have bought another one in the past, and I found that my previous one was a little better quality. Just because of my previous purchase, is why I give it 4 stars. It did come in the mail very quickly. And the person was lovely to work with. Well the designs for each of the words is plain and the same ; I thought it would have better graphics because some is blurry like it was computer printed and enlarged through a home printer; still the words you can't find anywhere else on paper to color, so the price is not bad considering it's average for any kind of adult coloring book. I wouldn't recommend if you are wanting to find something that'll keep you occupied and plenty busy, because like I said the same design is dull and a tad boring but if you plan to give some of the pictures away, hey have at it. It's good but not great. This coloring book has a lot of repeat patterns and the pages are not very thick. I used a set of neon gel pens and the color ruined the next page. This book has a lot of cute designs and it's a lot of fun but I would not buy again. Exactly what I was looking for and ordered, brand new impeccable quality, arrived 2 days sooner than expected. The only other feature I would ever ask for is perforated pages for tearing out however its easy to carefully remove pages from the spine, so no problem. Definitely recommend and if I ever want another one I will be ordering from here! We use it as "therapy" instead of just journaling ALL the time now we can add some color to it!